(i) FR 22(I)(a)(1) holds good with regard to availability of option clause for pay fixation, to a Government Servant holding a post, other than a tenure post, in a substantive or temporary or officiating capacity, who is promoted or appointed in a substantive, temporary or officiating capacity, as the case may be, subject to the fulfilment of the eligibility conditions as prescribed in the relevant Recruitment Rules, to another post carrying duties or responsibilities of greater importance than those attaching to the post held by him/her. Such Government Servant may opt to have his/her pay fixed from the Date of his/her Next Increment (either 1st July or 1st January, as the case may be) accruing in the Level of the post from which he/she is promoted, except in cases of appointment on deputation basis to an ex-cadre post or on direct recruitment basis or appointment/promotion on ad-hoc basis. 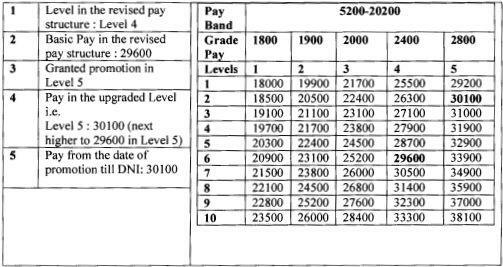 (ii) In case, consequent upon his/her promotion, the Government Servant opts to h his/her pay fixed from the date of his/her next increment (either 1st July or 1st January, as the case may be) in the Level of the post from which Government Servant is promoted, then, from the date of promotion till his/her DNI, the Government Servant shall be placed at the next higher cell in the level of the post to which he/she is promoted.